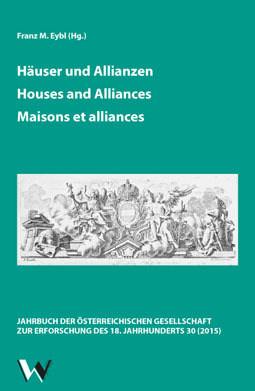 Häuser und Allianzen - Houses and Alliances - Maisons et alliances. 30 years after its first publication, the Yearbook of the Austrian Society for Eighteenth-Century Studies has become one of the leading publications for academic research concerning "The Eighteenth Century and the Habsburg Monarchy". Exceeding the spatial and epochal borders of Austria in the 18th century by far, it is an important contribution to the research on the century of Enlightenment. This status has been reached thanks to innovative and leading topics of discussion as well as the interdisciplinary and international approaches and authors. Due to the multitude of scientific fields and cultural contexts the yearbook covers, the focus of study changes every year – a tradition continued by the jubilee volume "Houses and Alliances. " Alliances built with the help of families were crucial for the positioning within the European balance of power in the 18th century and the extension of the political influence of the ruling houses. The first name-giving part of the volume discusses the grand aristocratic houses – especially that of the Habsburg monarchy – and their alliances, examining their marriage policy, aspirations in the Imperial Roman Church or personal relationships within the court. Relations with other European states are addressed and the authors contemplate the European linkages from the aristocracy down to the internationality of the courtly personnel. The second part of the volume broadens the topic and deals with the Art and Science in Theory and Transfer, such as philosophical and logical topics or the fresco and the antiquarians in the 18th century. Subsumed under Research and Materials, the contributions cover new material and sources, especially in the fields of art and literature, as well as current research and studies on the infrastructure and resource policy or the Latin language in Hungary. The volume also contains reviews, particulars of the Society and English abstracts of all contributions. Dreißig Jahre "Das achtzehnte Jahrhundert – Jahrbuch der Österreichischen Gesellschaft zur Erforschung des 18. Jahrhunderts"
Die Anerkennung der Pragmatischen Sanktion in den Tagebüchern Karls VI.